Kernel updates address known bugs and security vulnerabilities in the Linux kernel. They may be installed automatically on your Application and Monitor Servers as part of a SecureDrop release. All kernel updates are tested extensively against recommended hardware. If things do go wrong (e.g., the server does not boot after a kernel update), the following instructions will help you to roll back to the previous, working kernel. You can then report compatibility issues to us so we can work together to resolve them as quickly as possible. First, you need to physically access each server. Power down the server (safely if possible), attach required peripherals (keyboard, monitor), and power the server back up. If you have access to the password for your admin user, you can use it to log into each server without the use of two-factor authentication, which was disabled for keyboard logins in SecureDrop 0.8.0. You may have saved the password in the KeePassX database on your Admin Workstation. If you do not have the password, you can boot into single user mode instead. Once you hit a key, you will be able to interact with the menu with the up (⬆) and down (⬇) keys. 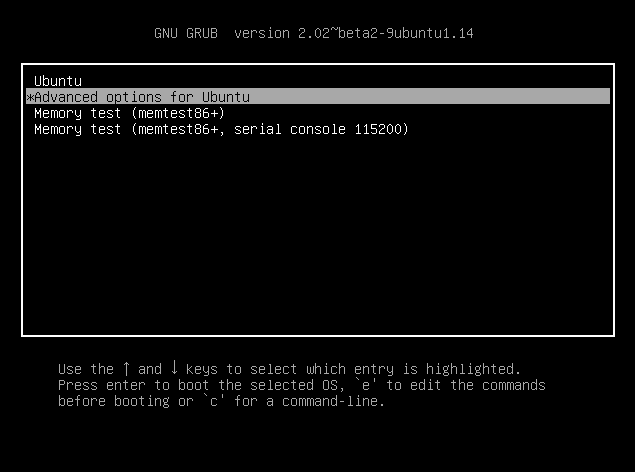 Select “Ubuntu” as shown above, and press “e” to edit the boot options. In the line that begins with “linux”, add the word “single” at the end. When you are done, the output on your console should look similar to the screenshot below. If everything appears to be operating normally, the outage may not be kernel-related. In that case, you may still wish to follow the steps at the end of this document to send us log information along with an issue report, and we will help you investigate. Reboot the server in a safe way with sudo reboot. 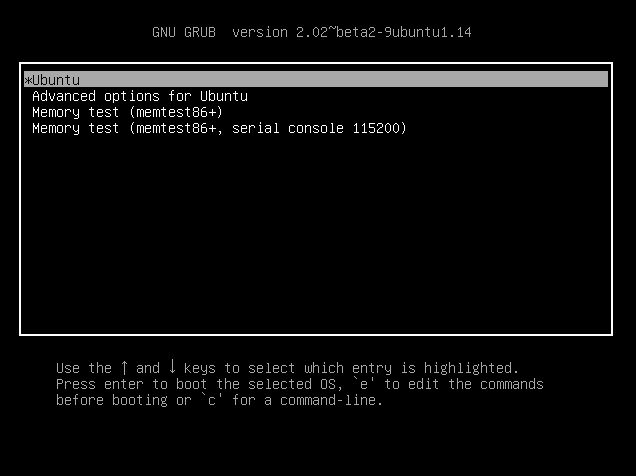 After the BIOS screen, you can select a different kernel from the GRUB boot menu by selecting Advanced options for Ubuntu, pictured below. Choose the option with the previous kernel version. If unsure, please consult the release notes for the most recent release of SecureDrop, which will include details about kernel version changes. As before, you may need to edit the kernel options to enter single user mode. The boot process should proceed normally. Wait until you get a login prompt and log in. Once you are logged in, check to see if you have network access. If you do, then your instance is having an issue with the newer kernel. In that case, we need to temporarily set an older kernel as the default. It is of critical importance for the security of your instance that we work together to resolve any compatibility issues. Rolling back to an older version is only a stopgap measure to avoid a prolonged outage of your SecureDrop instance. The server should come up automatically. From here on, you should be able to perform all administrative tasks via SSH as usual. If you want additional confirmation of the kernel version, the command uname -r should display the expected kernel version number. If you have encountered issues with a kernel update, it is important that you report them to us so that we may incorporate any necessary changes to our updated kernel, and so that we can work with you to switch back to the new kernel as soon as possible. If you are not a member of our Support Portal, we also encourage you to request help in the SecureDrop Community Forums. Choose carefully what information to disclose publicly. For example, raw logs may contain sensitive information useful to potential attackers. If you have changed your default kernel, we urge you to test an updated kernel as soon as it becomes available in a future SecureDrop release. Note that an update may be enforced as part of a release to protect the security of your instance. Please consult the release notes for details about kernel updates. You can test a kernel update without downtime for your instance by booting your Monitor Server with the new kernel. Log into your Monitor Server using the Admin Workstation. Shut down the server safely using the command sudo poweroff. Ensure that the server is fully powered off. Attach required peripherals and power the server back up. 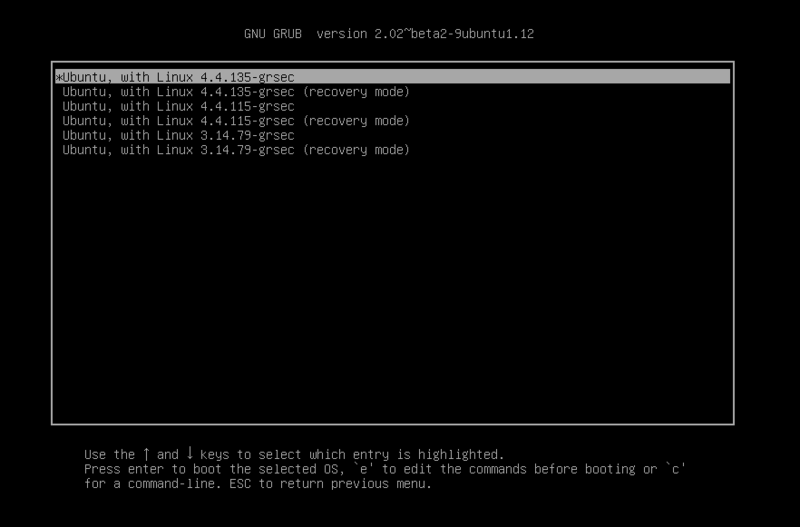 After the GRUB bootloader appears, select Advanced options for Ubuntu, pictured below. Select the new kernel (you do not need to use the version with recovery mode). If you do not know your admin account password, you can boot into single user mode by editing the boot options. Otherwise, press enter to boot. Verify that you can boot successfully, and that you have network access (sudo host freedom.press). If you still encounter problems with the new kernel, please report compatibility issues at your earliest convenience, and reboot the server into the old kernel for now. Make a backup of the file or take a note of the current value of GRUB_DEFAULT somewhere, so you can restore the previous behavior if needed. Change the line to GRUB_DEFAULT=0. This configures the bootloader to default to loading the most recent kernel version installed on your server. Safely shut down the Monitor Server, remove attached peripherals, and reboot it. Verify that it is working correctly by logging in using your Admin Workstation. If everything is working as expected, you can make the same change to /etc/default/grub on your Application Server as well. 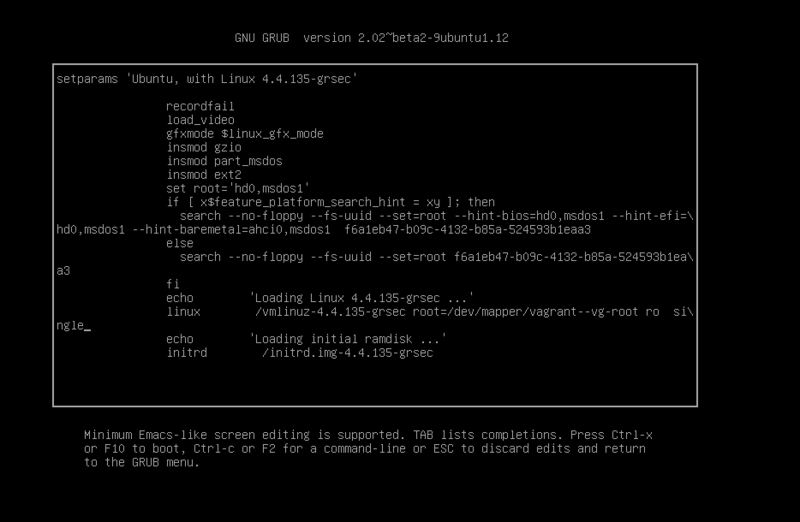 Remember to again run the command sudo update-grub when you are done. You can make the change on the Application Server from your Admin Workstation and reboot the server using the command sudo reboot. Subsequent kernel updates will again be applied automatically.